FFA - "JC" cartoon mocking Christian faith fails to make Comedy Central's "development slate for 2010/2011." Supporters’ emails to Viacom and MTV officials made a difference. The story line would have included Jesus moving to New York City to "escape his father's enormous shadow" in order to live a normal life and God would have been portrayed as an "apathetic" father, obsessed with playing video games. "JC" cartoon mocking Christian faith fails to make Comedy Central's "development slate for 2010/2011." Supporters’ emails to Viacom and MTV officials made a difference. According to Comedy Central, the story line would have included Jesus moving to New York City to "escape his father's enormous shadow" in order to live a normal life. The network said that God would have been portrayed as an "apathetic" father, obsessed with playing video games. In April 2010, Comedy Central censored South Park's depiction of the prophet Muhammad after intense Muslim protest. Click here to read Jihadwatch.com report titled "Comedy Central submits to Islamic intimidation -- now South Park cannot even say the word 'Muhammad.'" The liberal media has had a double standard for Islam and Christianity for several years. On one hand, they go the extra mile to respect Islam. On the other hand they malign, mock and defame the Christian faith shared by tens of millions of Americans. 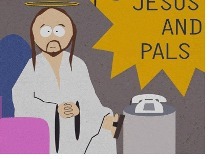 It appeared in May 2010 that Comedy Central may not show the same respect to Christians regarding their plans for developing the program JC that they did regarding South Park’s depiction of Muhammad. Thousands of supporters sent emails to network officials. Florida Family Association sent out three email alerts regarding this issue during the past eighteen months. The year 2011 has come to an official end. Comedy Centrals plans for the show JC within the “development slate for 2010/2011” did not materialize. Florida Family Association would like to thank the thousands of supporters who sent emails regarding this soon to be deactivated issue. Your emails made a difference. Thank you.